I have a gene that enables me to withstand inordinate levels of heat–both spice and temperature–in food and drink. What this translates to is the consumption of large amounts of hot sauce, peppers, chilies, horseradish, wasabi, etc., and eating food that is rarely hot enough by the time it leaves the oven or cooktop and makes it to my plate. Coffee? Forget about it. I think I’ve experienced two times in my entire life taking a sip of coffee that felt hot to me, and both times the actual temperature could probably have melted a star. I’m not right. I accept this condition however, with neutrality. I neither wear like a badge of honor nor etch into my psyche an emblem that I’m somehow less than, due to the fact that being asked how many stars I want my Thai food feels like being asked, How vast is the ocean? Sure, I’d like hotter coffee, and even more so, eggs, but I’d also like to play piano like Rachmaninoff. I’ve learned to live with disappointment. Separately, but somehow similarly in my mind, I don’t have the gene for spatial relationships. I’m a visual learner, so if the thing at hand is drawn out (well) and accompanied by thorough, clear, and correct instructions, I can usually get or assemble whatever it is over time with enough study and practice. But. If there are no pictures, and/or no (or poorly written) instructions, I’m f*cked. Here’s Loren: open the box, toss aside the instructions, take out the pieces, barely look at them, put it all together, go start using it, or go do something else fun. Here’s me: take out and read in their entirety, the instructions. Take all the parts and pieces, count them (cross-checking with the instructions), and put them into discreet piles. Go back to the instructions and start from the beginning. Get hung up on step one because it doesn’t make sense and the picture looks like it belongs in a kit on how not to draw things. (What is this arrow pointing to? Is this the long screw thing, or the medium one? Which side is the back? What is this black dot?) Get frustrated. Re-read the instructions. Force pieces into one another through the first two thirds to three quarters of the steps, only to discover I’ve assembled the whole thing backwards, upside down, or otherwise completely wrong. Go get wine. Im 48, and I never mastered the Rubik’s Cube. You do the math. 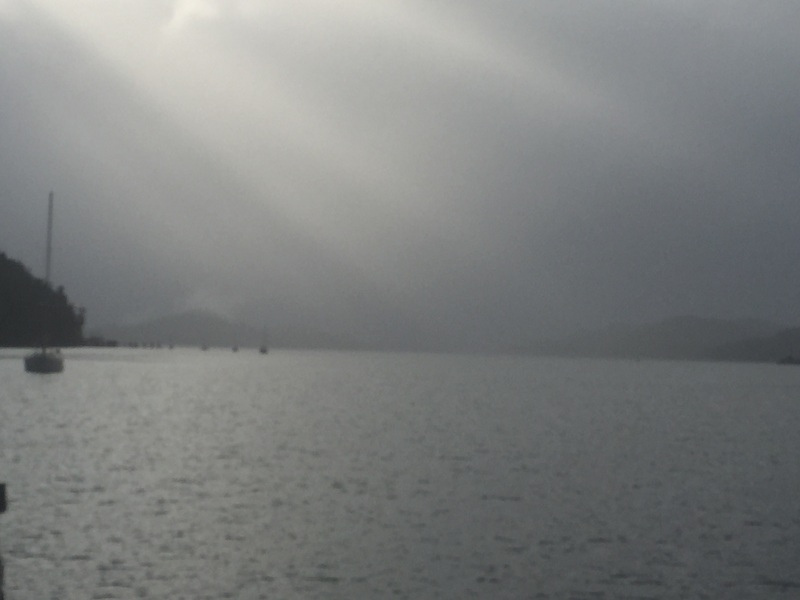 Last Saturday marked the beginning of week four of our sailing trip, and it came in with a wee bit of bad weather. 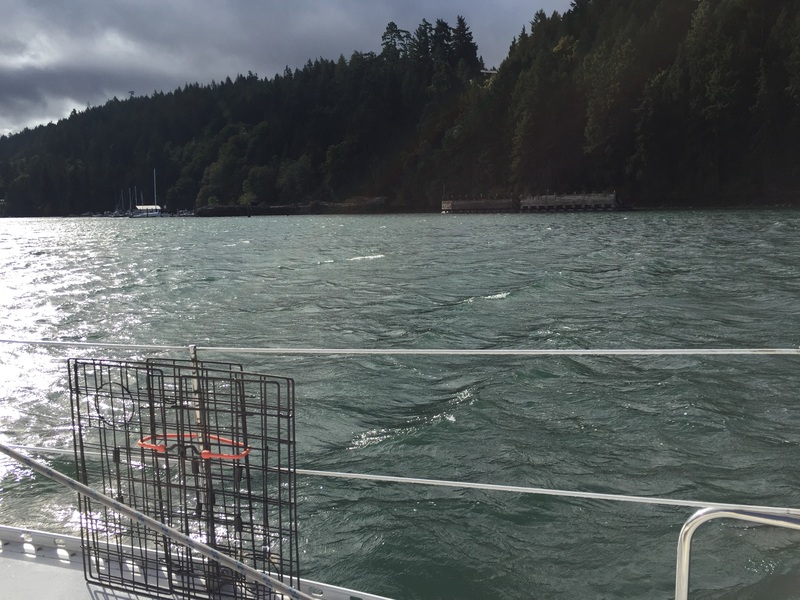 Winds reached, we found out two days later, 90 knots on the mainland (Vancouver). They experienced their worst power outage in a decade. The drought over the past year has dried out the soil, weakening root systems. Branches and leaves became sails, toppling countless trees onto cars and homes. We heard reports of people anchoring their boats and heading to shore, only to find out later their anchors gave out, and their boats went aground. Meanwhile, we had had amazing weather for the first three weeks. Hot, hot sun balls, clear skies, and warm, swimmable water. We did not see this coming. That day started out like every other day before it, and by 5:30 we’d settled into a nice big bay. We were all alone, in perfectly settled weather. It was idyllic. Flanked by busy coves packed with boats, we were doubly happy with our choice of anchoring in the cove of a privately held island, as we had no plans to go shore excursioning that night. We’d set the hook, cleaned the cockpit, and coiled the lines. Chores done, we were on to contemplating happy hour and dinner. First though, for some reason I still don’t know, I checked the weather. Hmmmm, that’s weird, I said. They’re predicting 30-knot winds tonight. And so it began. We surveyed our position in the bay with regard to exposure and wind direction. The mouth of the bay faced the direction from which the wind would be coming, and there wasn’t enough depth in the protected end. We couldn’t stay. We hauled up the anchor and set out to find shelter. Every time I checked the weather, the predicted wind speed was higher. By 7:00, three anchorages and the most protected bay we could hope for later, we were in for the night. Winds were predicted to hit 45-50 knots. There are few topics as debated amongst sailors as how to properly anchor. The short answer is get the heaviest anchor you can afford to carry, add a line, and make sure the bitter end is attached to your boat. The debate between that and all the other theories is endless, but all things considered, our approach is a good anchor that’s weighted for our boat, all-chain rode, a minimum of 3:1 scope, and 100% agreement that 1) we grabbed; and 2) we’re confident we can sleep. At the end of the day, it’s a delicate balance between art and science, but if we both sign off, we stay. Until this trip, I wasn’t the anchor-dropper; I took the helm. We’d find the spot, survey the depth, check for swing, consult the tides, and then Loren would go up and dropped the anchor, and I reversed the boat until the hook was set. Aside: After many anchorings and much yelling, we invested in a set of walkie talkies. Money well spent is an understatement. But like everything, at some point you have to learn, so about two and a half weeks ago, we began swapping. Loren took the helm, and I started dropping the hook. It sounds easy enough, I know, but there are angles involved. Also, a big heavy chain that, unless you control it, drops very, very quickly. There are marks on the chain you have to track while you’re lowering it so you know how deep you’ve gone. You have to know when the anchor is on the bottom and when/if it grabs and sets (good), or if it’s dragging on the bottom (bad). Finally, when all of this is done, and if all went well, and the anchor is properly set, you have to put onto the chain something called a snubber. This is sort of like a steroided-up bungee cord that absorbs some of the shock from the chain as your boat bounces around in waves and wind. Without a snubber, you’re fine, but you have to listen to the chain creaking and grinding and dragging around the sea floor all night, which is unnerving, and also a little like sleeping in a Vincent Price movie. The first time I put the snubber on by myself, I think it took me a half an hour. I’m absolutely certain a very small child could do it in about two minutes. This is not a complicated operation. Unlike my ability to reason through a math problem. 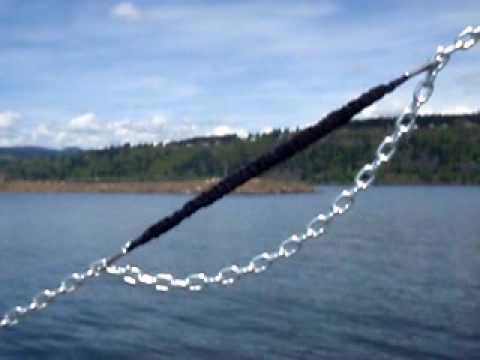 The snubber has a shackle on each end, connecting a long, stretchy cord covered by essentially a webbing-like sheath. You hook one shackle onto a link in the chain, secure the chain, pull up some more chain so you have an excess, then hook the second shackle onto another link of chain so you have about eight inches or a foot of chain hanging freely between the snubber. Then you drop all of that line and snubber business over the bow but not into the water. So, the snubber absorbs the chain stress, and that night when you go to bed, you hear silence instead of the ghost of Christmas past rattling around 5-inches from your head. I wouldn’t say it was the scariest storm I could imagine. I’ve seen pictures and read enough stories of sailors enduring hurricanes to know there are MUCH worse storms to weather, but it was a good starter storm. Our anchor bit (every time), and I got a lot of practice with my latest figure-this-out-without-written-instructions-or-pictures project. 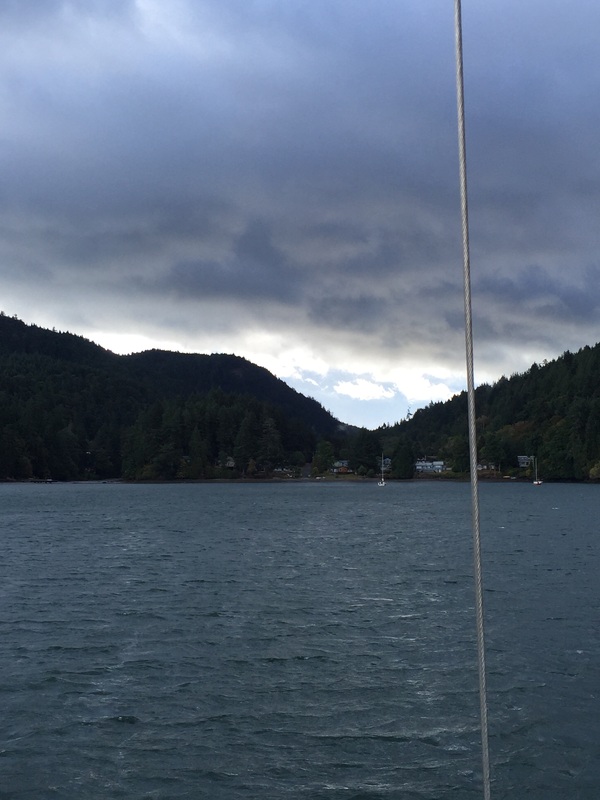 The wind blew at what felt like a lot more than the actual 50-knots it gusted through our cove, and we hung tight for two days. I don’t think EV budged an inch. It’ll be a week tomorrow that the storm hit. We’ve anchored four of those six nights. I just came in from dropping the anchor. I snubbed it in approximately five minutes. I’m not sure, and I don’t want to brag, but I think I might now officially know some algebra.